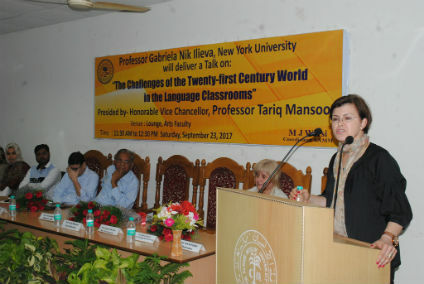 Aligarh: American academic, Professor Gabriela Nik Ilieva (New York University), who was recently presented with the George Grearson Award for promoting Hindi language by the President of India, has unique and engaging methods to help students learn. She said that since students use social media, teachers have to turn it to their advantages as these platforms have the power to enhance the collaboration and healthy competitive spirit in classrooms. Prof Ilieva said this, while delivering a lecture on ‘The Challenges of the Twenty-first Century World in the Language Classrooms’ at the Arts Faculty Lounge in Aligarh Muslim University (AMU). The lecture was organised by Language of Advertising Media and Market (LAMM), Department of Linguistics. “Students learn plenty of new things every single day, however, they rarely get precise instructions on how to use social media platforms,” said Prof Ilieva adding that the students rely on their intuition and the examples they see from other users, which don’t always lead them in the right direction and it’s time to set an example. Prof Ilieva added that teachers need to explain students on how social media can help them learn. She pointed out that academics should not determine practices that were fundamentally within a paradigm constructed ages ago, but they need to understand that students are coming into or engaging in a learning space that is constructed with new technology and methods of learning. Prof Ilieva further said that it is imperative that we engage students in creativity and innovation in our classrooms as it will enable them to make best use of their talents. “It will revolutionize the education system and equip students with confidence, discovery and enhancement of their skills, while grooming their personalities and preparing them to meet the futuristic challenges of this century,” she added. She further said that it is important to work on social justice education in class rooms. “In addition to academic instruction, one of a classroom teacher’s most important roles is to help students develop critical thinking, collaboration and self-reflection skills necessary to foster a better society and citizenship,” said Prof Ilieva. After welcoming the guests, Prof Mohammad Zahid (Dean, Faculty of Arts, AMU) said that it is important to have more lectures on the topic of ‘The Challenges of the Twenty-first Century World in the Language Classrooms.’ Prof Javaid Akhter (Registrar, AMU) thanked Prof Ilieva for taking time out of her very busy schedule to deliver this lecture. Prof Imitiyaz Hasnain and Prof Maleena from USA were also present on the dais. Academicians and students from various AMU faculties and departments were present on the occasion. Dr M Jahangeer Warsi (Coordinator) conducted the programme, while Dr Bairam Khan proposed the vote of thanks.